Why I was experimenting with my recipes just a few hours before I was to present a dessert type dish to a bunch of unknown (and known) people, I’m really not sure. 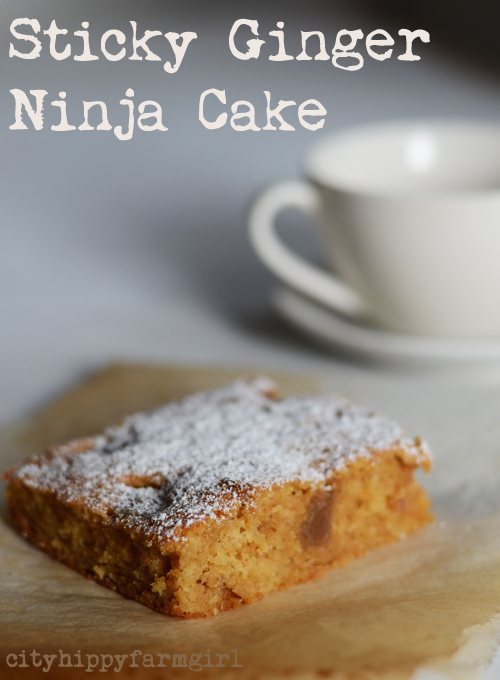 I did also have lofty ideas of making a ninja’s face out of dusted icing sugar on each tiny square of cake, but sometimes even I have limits in complicating things just before we are due to go out. Cream butter and sugar together. Then add vanilla, ginger, beaten eggs and molasses. Fold through pear puree, sourdough starter, wholemeal spelt and finally the self raising flour. Sprinkle the cake with extra brown sugar and press uncrystallised ginger pieces within the uncooked batter. Bake at 180C until golden and smells like a sticky ginger ninja kitchen. 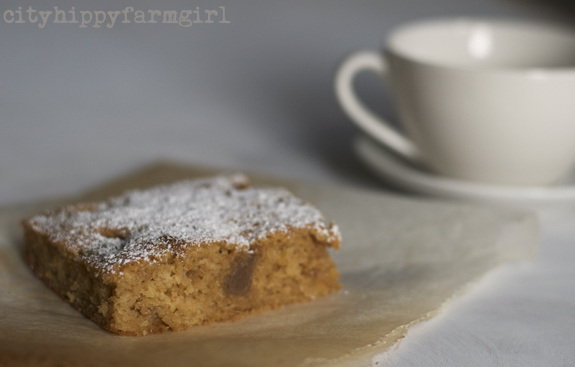 This entry was posted in Food Glorious Food and tagged cake, ginger pear, recipe, simple, sticky, sticky ginger ninja cake by cityhippyfarmgirl. Bookmark the permalink. ps is it ok with you if i ‘pin’ the recipe? Go for it Jane. Pin away. Hope you like the cake. This is my type of dessert Brydie. Two things leaped out at me. Firstly your most excellent rhyme 🙂 Secondly that you’ve used starter in it – that must make for a fantastically-textured, dense cake. Yum. PS. I also risked a new, experimental dessert recipe for guests on Saturday! Us cooking types have to grab our thrills where we can get ’em, hey? And the starter does give it a good texture. No light and fluffy airy cake round here. Lovely recipe using the starter and and great back story too! A lovely recipe! (since I adore Ginger anything) 🙂 I’m re-blogging, Brydie. Thanks so much. Oh not sure Linne. I’ve often had turmeric in warm milk, but that’s about it for using it in anything else but savoury stuff. It might be a bit strong in taste for the pear and ginger as pear is pretty subtle. Give it a crack though and let me know how you go. This cake has narf7 written ALL over it! I love me some stick, some ginger and most importantly ninja is my favourite flavour of all :). I can transform this scrumptious omni treat into a scrumptious narfescent veganese treat. In the process I can introduce another fantastically named cog into the equation; I can replace those humbly named eggs with an egg replacer recipe from one Ms Crescent Dragonwagon, a vegetarian author who wrote a fabulous book all about cornbread called “The Cornbread Gospel” that she cleverly calls “Eggscellence”. I can sub out the sourdough starter and sub in some kombucha or some of my thicker and more lively non-dairy kefir in order to get this sucker rising and the sky is the limit for adding whatever takes my fancy. I LOVE this recipe. 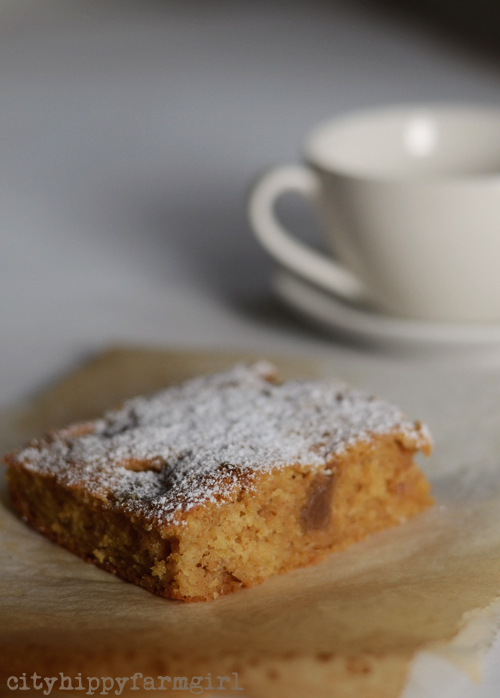 It is so customisable and promises a delicious, moist, sticky result which after all, is what cake dreams are made of. Perfect to go with a large mug of tea after a hard morning being Earl’s “Fat Anchor” in his endeavour to pee on every … single … shrub … in … the … neighbourhood… for our 5km walk. I NEED this cake! Excellent! I would love to see what you come up with for it. Moist and sticky is how we like our cakes around here…dry and fluffy, not so much. Love the name! I miss my sourdough starter, kicking myself that I never used it to make cake.